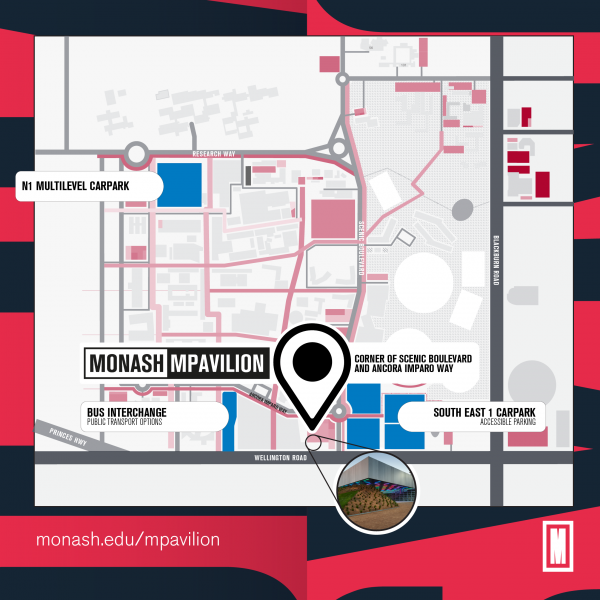 Download the Monash MPavilion Program! Mindfulness is a simple and accessible way of enhancing wellbeing and improving focus and performance. It is both a form of meditation and a way of living. Returning to the Monash MPavilion in 2019, the MLab Series introduces Monash to world-class musicians at the forefront of musical creativity and virtuosity. Lose yourself in our dark yogic disco -- Deep Soulful Sweats is coming to Monash with an open invitation to come together and exorcise through exercise. Experience music and dance from the four corners of Indonesia! Be transported to eastern Asia with this concert of Chinese and Japanese music. Discover the unique Architecture of Monash University’s Clayton campus with this photographic walking tour. Installation artist Lauren Berkowitz will collect plastic post consumer waste from the Clayton campus and combine this with foraged indigenous plant matter gathered from the local environment to create a hybrid ecosphere. MPavilion 2017 at Monash University launched in May 2018 at our Clayton campus. The Monash MPavilion is an event hub and community meeting place that celebrates design, creativity and innovation. This new venue presents a significant opportunity to connect students, staff and the wider community together through events, installations and workshops. All Monash Mpavilion events are FREE to access. Monash MPavilion lives on the Monash University Clayton Campus, on the corner of Scenic Boulevard and Ancora Imparo Way (see Google Map). Limited parking is available, check out our sustainable transport options for visiting campus. The fourth MPavilion arrived in spring 2017 in the City of Melbourne, designed by the Netherlands–based Architects OMA/Rem Koolhaas and David Gianotten. Designed as a contemporary amphitheatre, the MPavilion 2017 is the fourth MPavilion from a series of outstanding architectural commissions for Melbourne, leading the cities conversations on design and architecture. Today, MPavilion 2017 has a permanent home at Monash University Clayton, and is a creative incubator with a focus on innovation, research, sustainability and inclusivity. A meeting place for students and community, the Monash MPavilion will continue the vision of the Naomi Milgrom Foundation, the City of Melbourne, and internationally renowned architecture firm the Office of Metropolitan Architects (OMA). For more information on MPavilion, please visit the MPavilion website. Experience this colourful interactive installation by award-winning Melbourne artist Esther Stewart. Led by master musician Ravi M. Ravichandhira OAM and Narmatha Ravichandhira MA, this concert will showcase carnatic classical to contemporary Indian music. You are cordially invited to experience the evocative sounds of Persian ensemble music and solo music from Afghanistan. Meet no-nonsense aunties, Bindi & Bangles, for an afternoon of performance and cooking. Join the Australian Institute of Architects - Victorian Chapter for various events connected to the Victorian Architecture Awards - Presentation to Juries. The Plants is a site-specific musical installation that invites participants to create their own musical compositions using unique digital instruments… PLANTS! Join prominent photographer Katrin Koenning and MGA Senior Curator Pippa Milne in conversation as they dive into the artist’s motivations to create her photographic series Swell. Monash MPavilion events are free to attend for Monash University students, staff and members of the wider community. While events are free to attend, registration may be required. For a live event feed, go to the Monash University Campus Events facebook page. Want to hold an event at Monash MPavilion? The space can be booked by contacting Monash Venues.